Claire Malcolm, New Writing North’s Chief Executive reports on a special event. 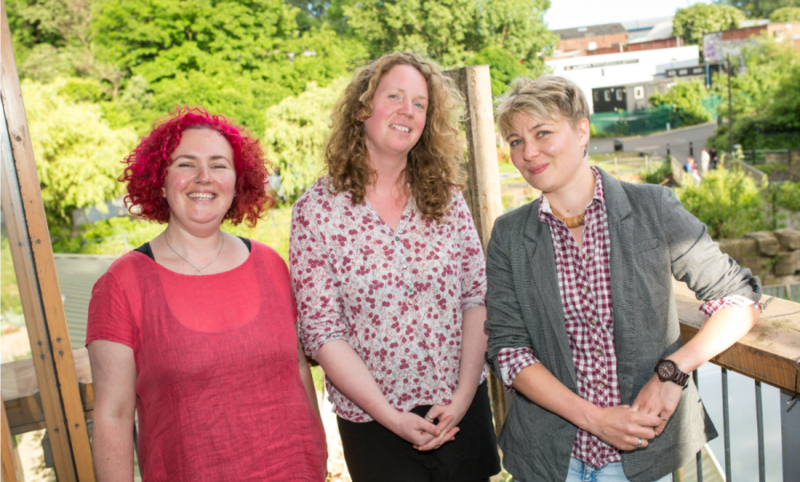 The sun shone down on Ouseburn Farm in Newcastle on Sunday 4 June for a special event in memory of the writer Julia Darling. Over forty people gathered to hear Julia’s work, to celebrate her memory with words and music and to meet the former and new winners of the Julia Darling Travel Fellowship. There was also a chance to meet the farm animals and to indulge in a glass of fizz and tea and scones with strawberries and cream provided by the farm café. Bev Robinson, Julia’s former partner and the manager of her estate welcomed everyone and introduced the band Kissed. It was fantastic to hear Julia’s regular collaborators Zoe Lambert and Charlie Hardwick harmonizing and singing songs from Julia’s shows as well as some rousing numbers such as ‘Those Were the Days my Friends’, a song they all remembered from Julia’s memorial which got the whole room singing along. Charlie then read Julia’s short story, Pearl from her first collection of work Bloodlines; a warm-hearted story about babies and lollypop ladies. Hearing Charlie read Julia’s words brought back so many memories for me of seeing Charlie in Julia’s plays over the years. Similarly hearing Zoe singing songs from Personal Belongings the production that Jeremy Herrin created with Julia brought a lump to my throat. But the mood was upbeat as I went on to announce the winner of the third Julia Darling Travel Fellowship: the Cumbrian poet and playwright Emma McGordon. Emma told the audience that she is going to use the award to travel to San Francisco to take part in the Frameline LGBTQ+ film festival, to give readings of her work and to begin work on a series of new poems in which she wants to reflect on her experiences of growing up in Cumbria. Although New Writing North had worked with Emma some years ago when she was a young graduate, I wasn’t up to date with her work and when she read a poem about growing up and her relationship with her father I was rather blown away (as were the audience). She’s an incredibly talented writer and it’s exciting to be helping her develop new work through such a unique opportunity. One of the highlights of the day was bringing together the three winners of the Fellowship so far. Our first winner Chloe Daykin who used the award to travel across Norway was there with copies of her new novel, Fish Boy; Michelle Green, last year’s winner, talked about her travels in Hayling Island and with the help of a very large map showed us how she was using the geography of the place to inspire digital tellings of the stories that she has written. The project has attracted Arts Council England funding and Michelle is busy working with a digital producer – and potentially drones (!) to bring the project to fruition. Michelle will be presenting work in progress from the project at Durham Book Festival in October so there will be a chance to experience the work then. The day ended with a raffle of signed books, book bags, art and wine to raise funds for the fellowship and with more music from Kissed to see us on our way. Julia would have enjoyed the day and would have loved seeing how her ‘fellows’ were using funds raised in her name to further their creativity and to make connections across the world. Bon Voyage, Emma! The Julia Darling Travel Fellowship is crowd-funded by writer and family friends of Julia’s in her memory. Worth £2,000 the award is open to applications each year. Applications for the next fellowship will open in early 2018. If you are able to make a donation to the fellowship please get in touch. To support the continuation of the Julia Darling Travel Fellowship, see the JustGiving page. To find out more about Julia Darling, see juliadarling.co.uk.